You can find the perfect gifts to bring home when you visit Dubai Mall, a favourite shopping spot in Dubai. Stroll along the riverfront or visit the must-see aquarium in this vibrant area. 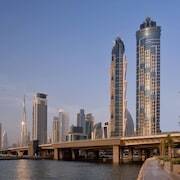 Explore the waterfront in Dubai with a trip to Dubai Marina. Amble around this family-friendly area's beautiful beaches or attend a sporting event. Burj Khalifa is a well-known landmark worth seeing in Dubai. Discover the desert landscapes and shops in this vibrant area. Nothing says holiday like spending a lazy day at Jumeirah Beach, a popular beach in Dubai. Discover the desert landscapes and shops in this culturally rich area. You can find the perfect gifts to bring home with a trip to Mall of the Emirates, a favourite shopping spot in Dubai. Amble around the area's beautiful beaches or seek out the ski slopes. 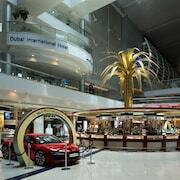 You can search for that perfect souvenir with a trip to Dubai Marina Mall, a popular shopping spot in Dubai Coast. Amble around this vibrant area's marina and enjoy its top-notch restaurants. Palm Jumeirah is a welcoming neighbourhood with many tasty options for restaurants and seafood restaurants. You can experience the local shopping and aquarium, or enjoy the natural beauty of the beaches. Jumeirah Beach Residence is a welcoming, romantic neighbourhood. The neighbourhood has many charming qualities, with its skyline among the more noteworthy. Many visitors come to enjoy the natural beauty of the beaches, while others visit for the local shopping. Deira is a welcoming neighbourhood. The neighbourhood has many appealing features, among them its skyline. Many visitors come to enjoy the natural beauty of the riverfront, while others visit for the local shopping. Downtown Dubai is a scenic neighbourhood that’s popular for its cafes. The neighbourhood has many appealing features, among them its architecture and skyline. Broaden your horizons with some local shopping. Bur Dubai is a welcoming, romantic neighbourhood. You can experience some local shopping, or enjoy the natural beauty of the riverfront. 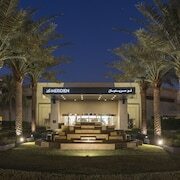 A welcoming neighbourhood, Al Barsha offers a variety of options for cafes and restaurants. Broaden your horizons with some local shopping. The desert sands meet high-end luxury in Dubai. 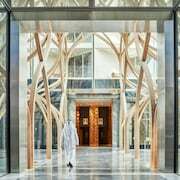 This city in the United Arab Emirates combines old world charm with the latest in sophistication. Whether you wish to lounge in an immaculate suite or relax in simpler lodging, there is a Dubai accommodation for you. 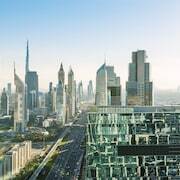 Swing away on the Emirates Golf Course or enjoy the ultimate shopping expedition in the Dubai Mall; there is an adventure waiting for you to enjoy while relaxing in well-appointed Dubai hotels. Dubai offers much to do in. Marvel at the graceful lines of the Burj al Arab, one of the most striking buildings in the world. Then head inland to visit the Al Satwa district, where you can get lost amidst Indian and Filipino restaurants and shops. If you’re a lover of horse racing, reserve a Dubai hotel near Meydan Racecourse to watch the thoroughbreds run. You can explore unique accommodation specials with Expedia.com.my, and see for yourself what adventures await your arrival. The most common mode of travel to Dubai is by aeroplane. Land at Dubai International Airport (DXB) or Al Maktoum International Airport (DWC). If proximity is a high priority, opt for one of the many Dubai airport hotels located near both airfields. However, the true beauty of this destination is beyond the airport boundaries. Although the Dubai Metro provides public transportation options for city centre travel, those wishing to travel outside of the city will need to hire a car or hail a taxi. From embarking on a safari to browsing over a thousand stores in the Dubai Mall, you’ll have plenty to experience when you arrive in this stunning city. 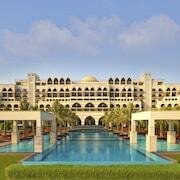 Browse here for Expedia.com.my to find last-minute deals, or even select the perfect Dubai holiday package. Stop fantasizing about your dream holiday: Expedia.com.my is here to help you turn your Dubai getaway into reality.